https://sep.yimg.com/ay/yhst-33477391359232/common-cleaner-wrasse-labroides-dimidiatus-bluestreak-cleaner-pacific-cleaner-8.jpgCommon Cleaner Wrasse - Labroides dimidiatus - Bluestreak Cleaner - Pacific Cleaner Expert Only!!! The Common Cleaner Wrasse,occurs on rocky and coral reefs in tropical (and some temperate) marine waters of the Indo Pacific. It has the widest natural distribution in the tropical Indo Pacific of these cleaners. The Common Cleaner Wrasse will form a symbiotic relationship with the other reef fish by cleaning them of unwanted parasites. Common Cleaner Wrasse are peaceful attractive fish with a most intriguing "dance" that they perform to solicit clients (other fish) and to calm them, allowing the cleaners to remove parasites and other debris from their clients bodies, fins, and mouths. Like all the cleaner wrasses, the Common Cleaner Wrasse�s sustainability in captivity is very less, even though it is the best survivor in this group of wrasses. This is high maintenance fish. The care level for this fish is high. Common Cleaner Wrasse needs an aquarium of 30 gallons or larger. Common Cleaner Wrasse is to be kept with a large number of community fish, which it can clean and thus obtain food. It may accept substitute foods such as chopped seafood, brine shrimp, and live black worms. It should be fed at least three times daily. This species of Cleaner Wrasse is more hardy than the others, it is still difficult to feed and maintain. Common Cleaner Wrasse should only be kept by experienced aquarists. It does not have any specific swimming level. Common Cleaner Wrasse needs a tank set, which may be of gravel and sand. Though once popular for the marine aquarium, this is not so today. Being specialized feeders, almost all these fish die within a few days to a few weeks. 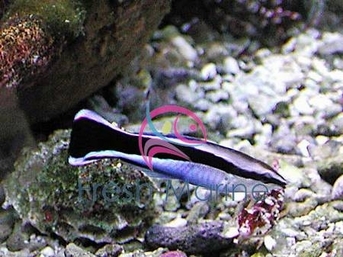 General Size Specifications: Common Cleaner Wrasse will come to you in 1 or 2 inch in size. Minimum Tank Size: Common Cleaner Wrasse needs a tank of about 30 gallons or more with plenty of spaces to hide and swim. It enjoys tank set up which is made of gravel or sand. Water conditions: temperature should be 72-78�F; sg 1.020-1.025; pH 8.1-8.4. Feeding and Diet: Common Cleaner Wrasse is a carnivore and likes meaty treats of chopped sea foods, brine shrimp, and live black worms.